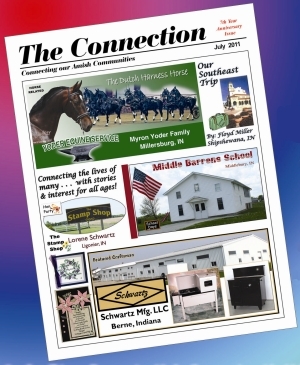 The Connection is the monthly Amish Magazine that really does offer something for Everyone in your Family…Young to Old! For only $3.75 a month, your family will get hours of enjoyment! Get to know our 40+ monthly writers…35 of whom are Amish. Along with our writers’ stories you will also enjoy many features each month. Like our Featured Craftsman which profiles a man and his trade, or Hen Party on a woman and her craft. Horse enthusiasts will enjoy the horse-related articles. Other features include Home Cookin (featuring 4 monthly recipes), Gardening Tips, Book Reviews, Travel Time (vacation stories), Momy’s Memories (childhood memories and grandkid stories), and much more. For the children, there is a story, monthly contest, kid’s activity page, plus so much more! Our subscribers get involved too, with short stories and original drawings through the Adult Entries. Our goal is to offer an enjoyable family magazine with old-fashioned values, for you and your family to enjoy! Don’t miss out any longer–subscribe today for hours of enjoyable reading every month. To subscribe: Send check for $45.00/1-year subscription (12 issues) delivered to your door! Please include: Name, mailing address (Street/PO Box-City-State-Zip), telephone #, and Order Code “AMA12”. If calling, please let us know you found us through Amish America.